“Don’t touch that girl, she’ll burn your fingers,” the FBI director J. Edgar Hoover once said about Doris Duke, the inheritor of James Buchanan Duke’s billion-dollar tobacco fortune. During her life, she would be blamed for scorching many, including her mother (whom she sued) and various ex-lovers. She established her first foundation when she was twenty-one; cultivated friendships with the likes of Jackie Kennedy, Imelda Marcos, and Michael Jackson; flaunted interracial relationships; and adopted a thirty-two-year-old woman she believed to be the reincarnation of her deceased daughter. Even though Duke was the subject of constant scrutiny, little beyond the tabloid accounts of her behavior has been publicly known. In 2012, when eight hundred linear feet of her personal papers were made available, Sallie Bingham set out to uncover the truth of the tobacco heiress’s life. She found a spectacular character forged in the Jazz Age who not only was an early war correspondent but was also a surfer, an environmentalist, a collector of Islamic art, and a businesswoman who tripled her father’s fortune. 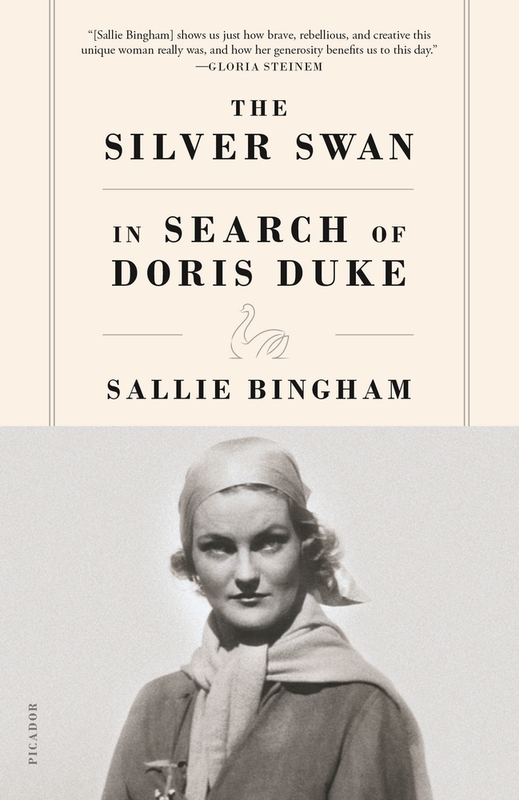 This spirited and perceptive biography dissects the stereotypes that have defined Duke’s story while confronting those disturbing questions that cleave to her legacy. The Silver Swan chronicles one of the great under-explored lives of the twentieth century and the very archetype of a modern woman. Sallie Bingham is the author of several memoirs, short-story collections, novels, plays, and poetry collections. Her work has been widely anthologized and has appeared in The Atlantic, New Letters, Southwest Review, and other publications. She has been a director of the National Book Critics Circle and is the founder of the Kentucky Foundation for Women, as well as the Sallie Bingham Center for Women’s History and Culture at Duke University. She has received fellowships from Yaddo, MacDowell, and the Virginia Center for the Creative Arts. Sallie's books include Passion & Prejudice: A Family Memoir, The Blue Box: Three Lives in Letters, Red Car: Stories, and The Silver Swan: In Search of Doris Duke.